museums, lapidary and last not least metaphysical professionals since 1978. Huge selection - all sizes and shapes! We dig deeper - we grasp higher for you! 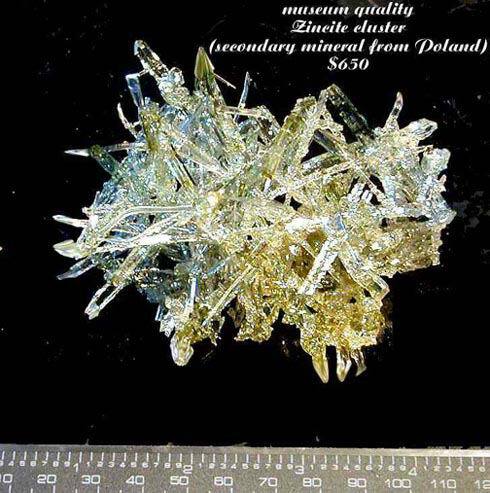 This mineral provides help for synthesis of personal power, creativity and physical energies. 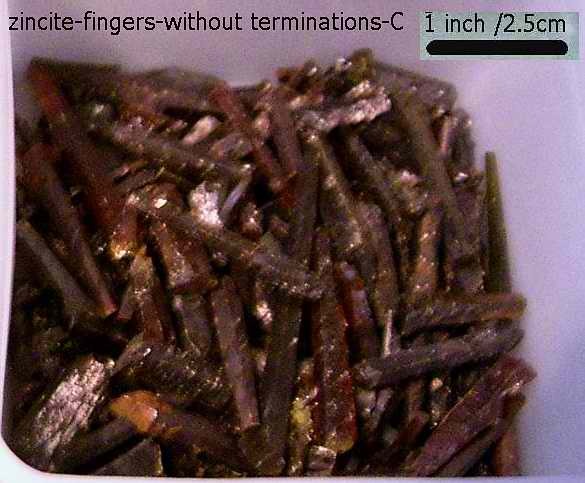 Since our Zincite Crystals crystallised from the gaseous (fire) state directly to the solid state without ever becoming a liquid (unlike 99,9% of all other minerals which have been at some stage liquids in their thermal history) this neither natural nor man made (although caused) mineral has some unique properties. Zincite can activate the lower chakra. The metaphor of a zincite crystal is that out of all the tragic, all the devastation and trauma something beautiful, valuable and desirable emerges! All that occurs follows a way and what happens follows a higher goal. Gabril: "Alles hat ein tiefes Sein, Alles hat den Sinn des Zwecks." ("Everything has a deep Beingness, everything has the sense of the purpose"). Bedenke stets: dass alles, was dir geschieht, dir zufällt, dir widerfährt, das Beste fuer dich ist. Und dass es deine Aufgabe ist herauszufinden, inwiefern. (Always consider: that everything that happens you is assigned to you. Everything that happens to you, is the best for you. It is only your task to find out, in what respect.) Red Zincite wants to help humanity and each individual to recognize full responsibility for all what is happening or all what is perceivable. 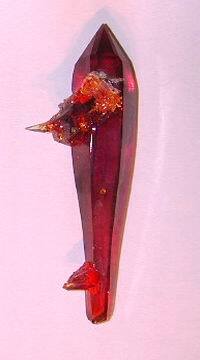 Zincite resonates to the lower (sexual) chakra. Zincite Crystals can be useful in the Radionics (Radionics is a technology of diagnosis and treatment at a distance which utilizes specially designed instruments practitioner can determine the underlying causes of malfunctions within a living system. field to intensify the response patterns exhibited during use of the "check-surface". Zinckite introduces the connection with the higher realms! Nice crystals and crystal clusters of Zincite occurring as a secondary mineral from Silesia , nowadays Poland , are a unique sample of a natural byproduct of Zincite production. sublimation which means sudden transformation from a very low state of Beingness to a very high (not passing levels in between) . 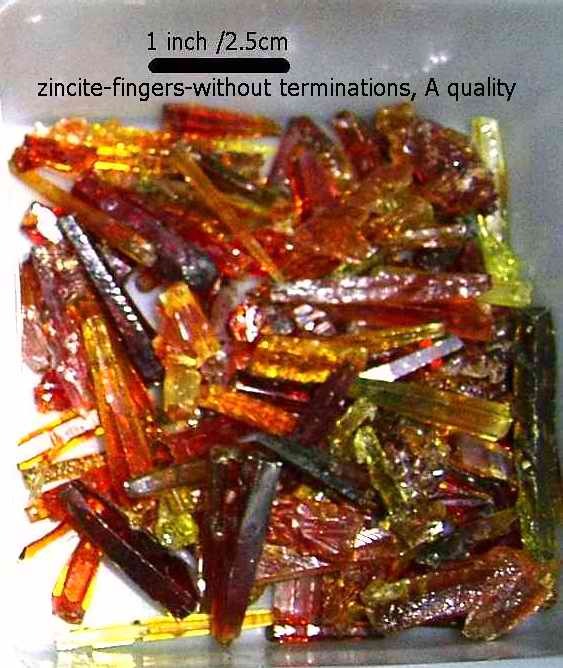 Zincite Crystal Clusters can Zinkite is used in pharmacy for healing of skin, hair and rheumatism. Are the Zincite Crystals natural or manmade? 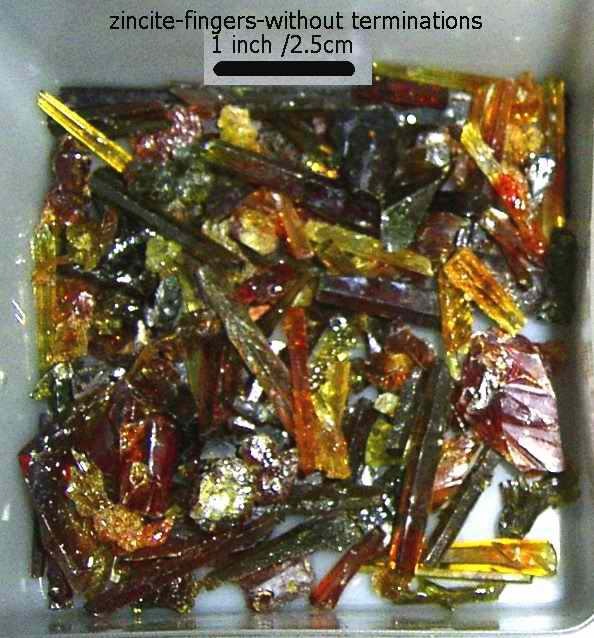 Our Zincite Crystals from Silesia are neither natural nor man made. They are a secondary mineral. In mineralogical terms they are a Sublimate which is the process of transformation directly from the the gaseous (fire) state to the solid state without ever becoming a liquid. 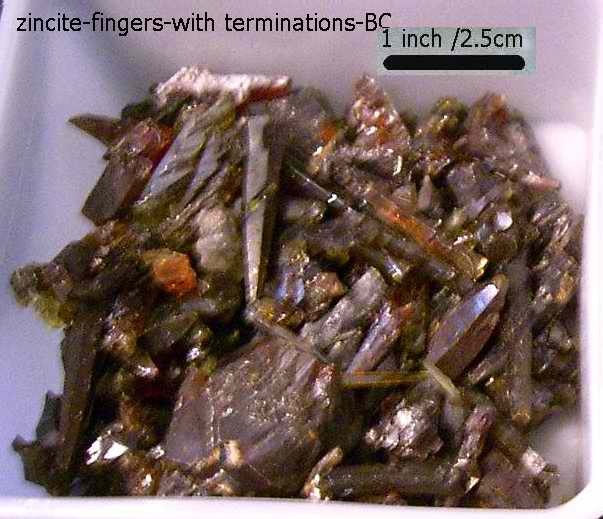 So the correct description of the formation of Zincites Crystals is they grew naturally as a by-product but they are man-caused (not man-made) since they occurred accidentally. The silesian (today in Poland) Zincites start from $65/kg (min.800g) for low quality (no cutting possible). Good cutting quality is $1.20/g (min.50g) or $980/kg.